This PDF 1.5 document has been generated by LaTeX with hyperref package / pdfTeX-1.40.16, and has been sent on pdf-archive.com on 28/02/2017 at 20:58, from IP address 31.165.x.x. The current document download page has been viewed 154 times. File size: 315 KB (19 pages). the help of our supervisors. the most popular websites/applications on the Internet, that one would use separately, while planning a trip (For eg: Booking.com, AirBnb, TripAdvisor etc.). automatically provides suggestions to the user while learning from their actions. thorough list of possible day to day activities that fit to the given time frame. Available tools . . . . . . . . . . . . . . . . . . . . . . . . . . . .
Other travel applications . . . . . . . . . . . . . . . . . .
Shortcomings . 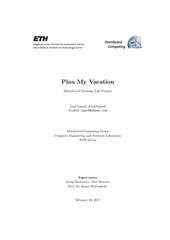 . . . . . . . . . . . . . . . . . . . . . . . .
Overview of the Plan My Vacation android application . . Using the skiplagged API . . . . . . . . . . . . . . . . . . . . . . Flight selection and ordering . . . . . . . . . . . . . . . . . . . . The official un-official Airbnb API . . . . . . . . . . . . . . . . . Using the Airbnb API . . . . . . . . . . . . . . . . . . . .
Booking.com . . . . . . . . . . . . . . . . . . . . . . . . . . . . .
Overview of API . . . . . . . . . . . . . . . . . . . . . . .
Scraping Booking.com . . . . . . . . . . . . . . . . . . . .
Hotel selection and ordering . . . . . . . . . . . . . . . . . . . . . FourSquare . . . . . . . . . . . . . . . . . . . . . . . . . . . . . . Categories . . . . . . . . . . . . . . . . . . . . . . . . . . .
Time of day and popular activities . . . . . . . . . . . . . Limitations . . . . . . . . . . . . . . . . . . . . . . . . . .
TripAdvisor . . . . . . . . . . . . . . . . . . . . . . . . . . . . . .
Querying Data . . . . . . . . . . . . . . . . . . . . . . . .
Google Queries . . . . . . . . . . . . . . . . . . . . . . . . . . . . Places API . . . . . . . . . . . . . . . . . . . . . . . . . .
Querying google.com . . . . . . . . . . . . . . . . . . . . .
Top Attractions . . . . . . . . . . . . . . . . . . . . . . . . Creating an Annotated R-Tree and Trip Generation . . . . . . .
Trip Ordering . . . . . . . . . . . . . . . . . . . . . . . . . Architecture overview . . . . . . . . . . . . . . . . . . . . . . . .
Server implementation . . . . . . . . . . . . . . . . . . . . . . . . Client implementation . . . . . . . . . . . . . . . . . . . . . . . .
Server-client communication . . . . . . . . . . . . . . . . . . . . .
REST API . . . . . . . . . . . . . . . . . . . . . . . . . . Saving data to mongodb . . . . . . . . . . . . . . . . . . . . . . . Saving User Data . . . . . . . . . . . . . . . . . . . . . . . Saving Trips . . . . . . . . . . . . . . . . . . . . . . . . . Saving User Preferences . . . . . . . . . . . . . . . . . . .
reading reviews and can instead plan one in a couple of minutes. and disadvantages of this API are outlined in Section 1.1.2 and 2.1. Booking.com and Airbnb were our primary and most important sources. project we were able to gain access to their API through unconventional means. The largest and the most useful database of popular locations and reviews. would normally use to find places of interest that are not listed in the aforementioned sources. able to create a unique list of recommendations for the most relevant attractions. to display inside the android application. the Booking.com and SkipLagged wrappers, i.e., scraping the airbnb platform. manipulate. The downside of this JSON data is that it is massive and unstructured. in using this data in combination with the other API’s. API keys to extend the rate limit as best as possible. linux server, serving a node application for each API endpoint on different ports. This file has been shared by a user of PDF Archive. Document ID: 00561829.